I’ve been ruminating, as one does, on weighty matters such as the meaning of life and the state of the hobby. The hobby is comprised, at its leading edge, a group of luminaries who scratchbuild what they want, kit-building and bashing where possible. There are even loftier modellers of myth who scratchbuild pretty much everything, and thus model exactly what they want. The Internet and digital technologies (cutting, etching, printing) have lowered the barriers on obtaining exactly what you want to the point where this is now accessible to pretty much anyone. While it still requires work, you can research, obtain resources, discuss at distance, design, order and purchase all manner of products online that are precisely what you need for a project. Alternatively you can commission somebody to do it for you. This does come at a cost, but then most things that are worthwhile do. Well, if you assume that anything you want to model is essentially available, then you focus on what you want rather than what you can get. What is the point of a kit collection that you might get around to one day when you can focus on what you actually want now? Would you rather model broad brush at low levels of detail or zoom in a little and model a more convincing scene with details that can stand a higher level of scrutiny? There is no right answer here, of course, but it is the old balance between quantity and quality. Where ‘quality’ is unavailable then quantity is the only option, but when there is the opportunity to get great models that are exactly what you want, there is an opportunity for a lot more intimacy and character. As an example, consider figures in any scale smaller than ‘O’. The options until quite recently have been rather average. Where good figures were available the scene needed to fit the figure rather than vice versa. Many figures were only vaguely humanoid, and best used in a way that avoided any possibility of full scrutiny. 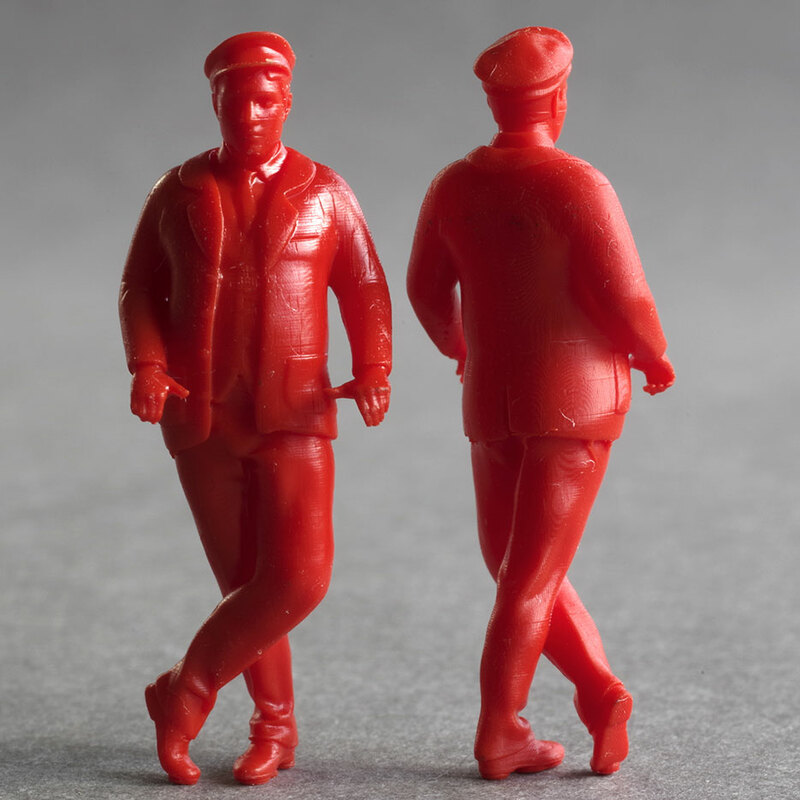 With digitally generated figures it is relatively easy to craft figures that are not only very convincing, but also customised to fit the scene. Custom figures are quite feasible and quite a few in my range have come about from my own needs or commissions from others. 1:64 Guard on a rail. Sculpted to a customer’s request. Another example is the forthcoming F locomotive kit. Previous kits for the F have provided one version of the saddle tank in whitemetal, and I gather that was a challenge. It will be possible to order one of six variants for the NZFinescale kit. These will come as a single part incorporating a sound box and speaker. Not that much work. Copy, cut and paste means the features are only drawn once. I fully realise that maybe nobody will want a Vulcan. That’s OK, I may have wasted less than 10 minutes on the unique rivet pattern. I don’t need to print one unless I have an order for it. I’ll be either printing or resin casting these. Low volume techniques where it is as easy to do one as another. There probably are variants NOT covered in this collection. Should you want one of these, it’s possible, and not even that difficult. The intention here is to assist the builder to get the F locomotive that he wants, rather than just ‘an’ F. If this doesn’t turn you on, just throw a die, or choose the one you like best. 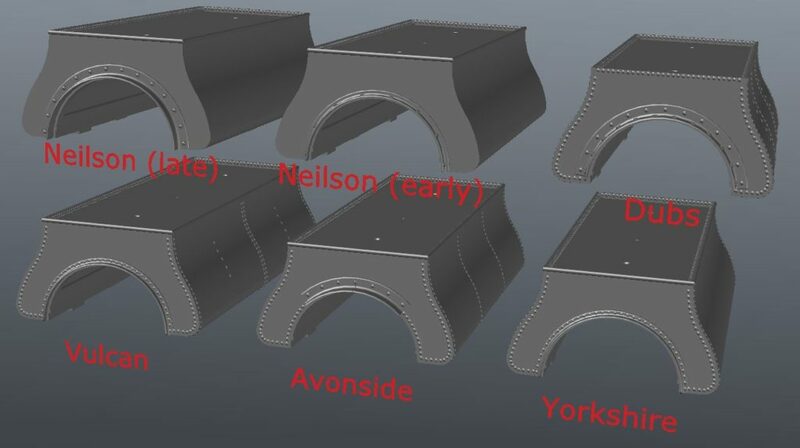 Similar principles hold for the various cabs that will be supplied as etched parts. Once the basic kit is designed and drawn, adding a few cab variants doesn’t take long, and the amount of etched metal used does not meaningfully affect the kit cost. Increasingly, the work I’m doing (other than S scale NZR kit/part manufacture) is commissions for customers who want specific things that are not otherwise available. There has always been a market for this, but some things have recently become so simple that so much more is viable for modellers of average means. What really prompted this little sermon, was the realisation that my own model planning has shifted along these lines. I’m thinking far more about vignettes and cameos. Express running has never really featured in my thinking, but I now find my focus is drawing even tighter. Maybe I’m just overdue a visit to the optometrist! Good luck with the Optometrist. Lawrence you’ll probably find that not everybody wants express running. Apart from running in a new loco I much prefer the more realistic point to point type of layout. Over the decades I’ve watched the scene change from what’s available to what a modeller would like. And now we’re into a choice of not just an F but almost a choice of any variant of the F loco. When I started in S scale NZR in 1953 I could have pretty well anything I wanted, provided I had the skill to scratchbuild it because there were no kits or commercially available NZR models. The availability of the CCW 56ft carriages and the Ratio Af and Z wagon were milestones. For me the scene has almost gone full circle getting back to having whatever one wants. But this time available to a wider range of modellers and not just those who could scratchbuild. All true. You are right that things have come almost full circle – the difference being the ease with which quality results are possible. I think with detail, sound, DCC and good runing, desired speeds have come down substantially.